Our Buffalo NY Web Development team will craft a website to suite all your needs. A full-service digital marketing agency in Buffalo, New York. Just like brick and mortar building, well-written code makes the difference in whether it will stand out and function, and of course, display on various devices and screen sizes. 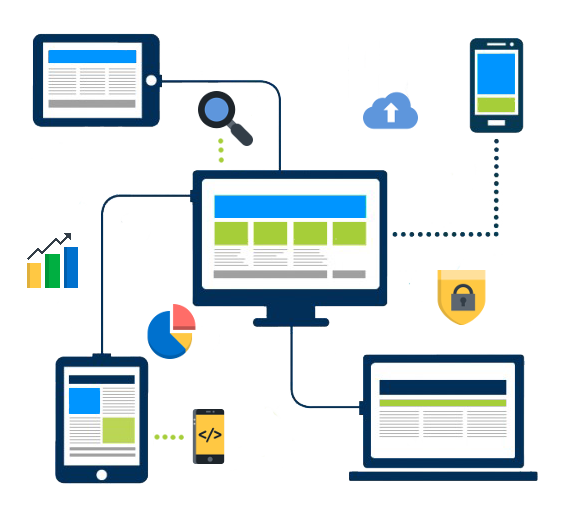 Our Buffalo NY web development team will create custom code on multiple platforms to provide you with the best performing website your company needs. Our partnership will last far beyond the launch date. If you’re looking for a Buffalo NY web development agency to build your website with SEO, then contact BIG Waterfall today! Call us at 716.222.3006 or email info@BIGwaterfall.com to request a FREE web development consultation. Do You Have Web Development Project We Can Help With? Have A Question About Website Design or SEO? We’re here to help answer your questions. Digital marketing can be complicated and overwhelming, our team is on hand to help you with every aspect of website design & development. We scale our client’s websites to their growth. We have been building responsive designs for over ten years now, while most agencies are just now adapting. More customers are accessing the web via their phone or tablet and we make sure your website is fully functional and easy to navigate on every device. Google highly recommends businesses invest in creating a responsive website versus a separate mobile website. This is better for your SEO because unlike separate mobile websites, you just have one URL and one set of code. We Go Beyond Web Development. Our WordPress development team uses the latest technology to improve the user experience. Our expert developers will properly add safe plugins that adds value to your website. Let our team create a high-quality and professional design that suites your business and audience. We provide end-to-end security solutions and test your website to prevent future attacks. BIG Waterfall provides peace-of-mind WordPress hosting. Fast, secure and optimized. Improve your search engine ranking with an aggressive SEO campaign. Get your free SEO Analysis. Draw new and relevant visitors to your website instantly with a Google AdWords campaign. Add a new and professional logo for your business to go along with your new or re-designed website. Our web development team is working round the clock on the WordPress content management system. WordPress is the world’s largest CMS and is also Google’s preferred environment for websites. With over 10+ years experience on developing websites in Buffalo, New York, our code is stable and innovative. If you need an e-commerce, lead generation or branding website our developers will engineer a website geared toward a positive ROI.